I know, I know, I indicated in the last post that you’d have a new, vintage-style wrap blouse in your hands by the end of the next week. And then I got the flu. On a positive note, I lost 4 lbs. simply because eating would have taken more energy than I had available. I drank a lot of (caffeine-free) tea and vegetable broth. I am more enamored than ever before with the heat-retention power of a glass-lined Thermos, which enabled me to shuffle into the kitchen once to make a quart or so of liquids (I was filling two Thermoses, or, as I prefer, Thermi), and then have access to hot beverages for the rest of the day without having to leave my nest on the sofa. Since regaining my health, I’ve finished deconstructing our Dot Blouse! I took the blouse apart at the seams, undid all of the hand-sewn rolled hems, and taken out the darts. I’ve ironed everything flat. I’ve spent hours tracing the pieces, cleaning up the curves, checking measurements to make sure the new seams will once again line up. Laying pattern pieces out in various ways in order to use the smallest cut of fabric possible. And just when I was about to share a PDF of the new pattern with youâ€¦I question why a bust dart on the original was placed going into the sleeve instead of under the armsyce. So I’m going to redraft that piece. And run to the fabric shop for some muslin, which I really should have thought of earlier. And I will make sure this new, improved pattern actually works. Then, and only then, will I dare to share the Dot Blouse pattern with you. Stay tuned, kids! And we shall call this blouse, Dot. Matches the pleated wool skirt perfectly, yes? Once upon a time, I bought a vintage blouse that is a very flattering cut but which is damaged-beyond-wear. That is to say, the seams are all intact, but the fabric itself is starting to fall apart. However the price was right (probably just a few dollars, I don’t exactly recall) and I planned to deconstruct the blouse and make myself a pattern. Planned. Fast-forward a couple of years and I’ve once again tipped over the overflowing box of patterns that is not yet listed in Winkoramaâ€™sÂ live inventory. I stack the patterns back up and on top of the pile now sits Butterick 5074, dating to 1949. Hmmm, Butterick 5074. It sure does look an awful lot like the blouse I’ve been meaning to deconstruct. I could leave the vintage blouse alone, and use this pattern instead. Easier! Naaahhh, the old blouse is already at the end of its life. It would be nice to let it be useful one last time. I’ll sell the pattern as plannedâ€¦oh, but maybe I can have a one-on-one sew-along with the buyer of the pattern! Naaahhh, that means finding the right customer for the pattern and who wants to play along. Okay, okay, what if I deconstruct my old blouse, and post the pattern online as part of an anyone-can-play sew along! Which means that the bulk of this challenge is in getting me to finally deconstruct the blouse. So I need YOU, my dear readers, to inspire (i.e., pester) me to continue with this plan. What’s a “background outfit”? Anyone? What I do know is that either blouse would be nice for warmer weather and also work well for layering under cardigans or jackets. While both are excellent patterns for novices, I think the Dot Blouse (as the vintage blouse shall now be known) might be even easier to sew because A. there is less gathering to fuss with and B. the true wrap style makes for a more forgiving fit. The end result isn’t as tailored, but that’s the trade for less effort. Another nice feature of the Dot Blouse is the short “tail” along the back, which lets you tuck the back side of the blouse in to a skirt or trousers. No surprising breezes! So, for those of you who want to sew along because you’d like to add a classic staple to your wardrobe, or who want to learn to sew with a pattern more versatile than an A-line skirt (yawn), please comment below and give me some encouragement!Â The hardest part of this sew-along will be on my shoulders; deconstructing the blouse and drafting a new pattern. The patternÂ isÂ simple, but drafting is something I rarely do and I’m sure to goof it up a time or two before I’m ready to have you guys join in. This means thatÂ we won’t start until afterÂ the first of the new year, when time is more plentiful. If you simply must sew up a blouse for a Christmas dinner or New Year’s Eve party, you can buy Butterick 5074 here (while it lasts). 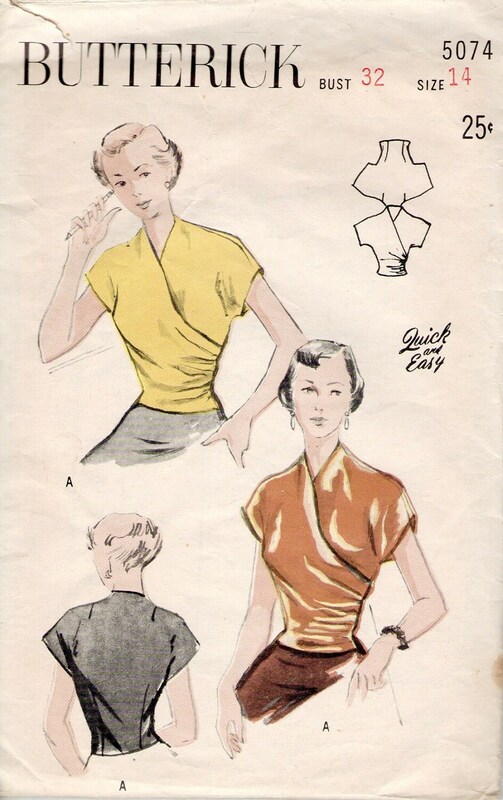 Public Service Announcement: Why don’t I simply copy and post the Butterick pattern for this sew along? Just because a pattern is old, does not mean it’s out of copyright. Copyrights can be renewed,Â thus protecting the copyright for 95 years from the original publication date (provided the original publication date is 1923 or later), and believe me, companies like Butterick aren’t going let their patterns go into Public Domain if they can help it. You can not (legally) sell or otherwise make available copies of their patterns. Some pattern companies have more lenient rules about the sharing of their intellectual property, but Butterick isn’t one of them.